When I was at Uni, a spin dryer was a real life-saver. Our flat didn't have a garden so my options for drying clothes were really limited. Granted, the dryer I had was 2nd hand (as you would expect from a poor student). I often had to lean over it to stop it bouncing out the window - but it got the job done. The latest range of clothes spinners are much better than the 20-year old model that I had. They are also perfect if you do a lot of hand-washing, or need something for a caravan or boat. Here are our picks for the best spin dryers on the UK market in 2019. How Do Spin Dryers Work? A conventional tumble dryer, whether vented or condenser, works by using hot air directed into the machine combined with the spinning effect of the drum. This means the machine needs a heating element, which is not the most energy or cost-effective method of drying clothes. Likewise, if you use a combined washer/dryer, you have the same need for heating, and in either case you need to get rid of the heat without it dissipating into the room and causing damp. A spin dryer works without the need for heat. Typically, it is a vertically mounted drum that spins at very high speeds, driving the damp out of the laundry without the use of heat. Therefore, it can be cheaper to run, and also to buy. Furthermore, they are usually top-loading so take up less space. There are a couple of things you should be aware of, however: they can be very noisy, thanks to the high spin speeds, and they also tend to crease clothes more than a conventional dryer. But, for people with limited space and a lower budget, this may be the way to go. Available Space – one of the benefits of a spin drier is that it is top-loading, so you do not need to factor in space for opening the door. These models all take up very limited floor space, and as they have no plumbing necessary, can be placed anywhere there is suitable power and ventilation. Capacity – the spin dryers we have featured offer between 4kg and 6kg capacity; so they can be used for small washing machine loads, or just the essentials like jeans and towels. Speed – you need a spin speed of 2800rpm – the standard for these – to get rid of excess water effectively, as anything less will not be efficient. Gravity or Pump Drain - Spin dryers have two main types of drainage systems, gravity drain, in which the water is drained away naturally, and those with pumps that aid the process. The latter are usually more expensive. Energy and Noise – Spin dryers can be quiet noisy - and that's just down to how they work. We've tried to choose models that are quiet and as energy efficient as possible. Along with value for money, these are the main feature we considered when compiling our spin dryer reviews. 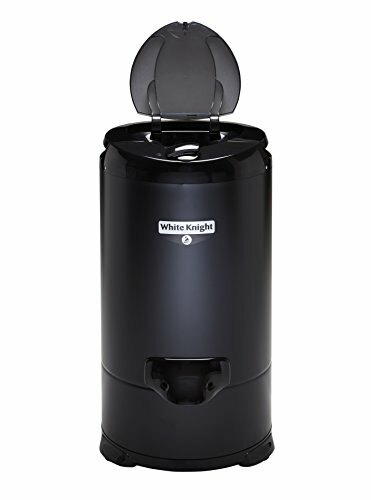 The White Knife 28009 is a good-looking, really compact spin dryer that still has a 4 KG drum size. This makes it perfect sized to care of the essentials, or you could run it twice to cover a family-sized load of washing. This model has a spin speed of 2800rpm; this is about the standard speed for a spin dryer and – make note – is around twice that of the fastest tumble dryers. It has a stainless-steel drum for durability and a locking lid, to stop young hands from prying and clothes from getting out during drying. This model only weighs 4.1 kg, so it's really easy to move around and hide away after use. It also measures just 64 cm tall by 35 cm wide, which is about twice the size of an average blender. This means it doesn't take up a lot of space, and you could have it on a counter-top. Although the manufacturer doesn't provide noise specifications (perhaps this depends on how well you load the dryer and where you place it), many users have remarked it's pretty quiet. If you're looking for something that's light, compact and can still handle a 4 kg load, the White Knight 28009 is a great spinner which won't break the bank. If you're in the market for a more "Heavy-Duty" spin dryer with a larger drying capacity, this OneConcept model could be the one for you. With a 6 Kg load capacity and 2,800 r.p.m speed, it can handle a full-washing load for a couple, or the essential for an entire family. And the really great thing is the drying cycle time is just 2 - 3 minutes - which is incredibly quick! This oneConcept design is very simple to use, surprisingly compact for the capacity, and is a gravity drain machine. Note that, as with most of these, you need a separate container to collect the water. There are also safety locks that can bring the spinner to a halt in just a few seconds. With a self-stabilizing mechanism, this machine is somewhat quieter than some of the others in its class. There also non-slip feet to stop it bouncing around, too. It dimensions are 35 cm x 65.5 cm x 41.5 cm, which is pretty compact. However, on the downside it does weigh 13.7 kg. This will make it harder to move around, but the weight will provide a more stable base when spinning. All in all, this is a good model that offers excellent capacity and performance. It is priced much higher than others on our list, but is a great choice if you want a dryer that can handle a larger capacity. The Thomas 776SEK is the very model of German efficiency. It's a quiet, light and compact 4.5 kg capacity dryer which comes which comes with a 2-year guarantee, too. This model is really compact, measuring just 35cm by 35cm by 65cm. This makes it perfect if you're looking for something to fit into a small space, or for your caravan or boat. It does weigh 11 kg, so whilst not as light as the previously reviewed White Knight model, it is a few kilograms lighter than others on our list. The manufacturers have been really transparent with their specs (which is unusual, and I'm guessing that many similar models come from China, so they could have something to do with it) and say it has a noise output of 67 dB. To put that into perspective, while it is definitely not whisper-quiet, it's slightly quieter than the average vacuum cleaner. This spinner has also been given an Energy Efficiency Rating of "C". This does sound bad, but it is in line with the industry average. The weighted average annual energy consumption is also given as 30 Kw / h, so this model will cost less than £5 to run a year. To put that into perspective, a tumble dryer can cost around £100. As well as it's excellent build-quality, many users have been impressed with how dry their clothes are after use. Whilst they won't be ready-to-wear, they shouldn't need line-drying and be ready for ironing. One downside to mention is this model does not come with a spin mat, so this does need to be bought separately. ​The price may well put a lof of people off the Thomas 776SEK, but it is backed by a 2-year manufacturers guarantee. A well-known name in household appliances, Indesit offers this very compact – similar in size to that above – spin dryer that does exactly what you would expect it to. This Indesit Spinner holds 4 kg of washing, so it's perfect for a single person or if you want to dry your delicates quickly. It is a gravity drain model, so you need a container for the water, but you can put it anywhere, and is light enough for grandmothers to move around with ease. You get a 2800 rpm spin speed – again, this is pretty much the norm for one of these and is the optimum for getting the water out of clothes – and a number of timer settings from very easy to understand controls. It's also light and compact measuring 34.8 cm x 34.8 cm x 62 cm, so it could also be ideal if you're looking for something for a caravan or a boat. The energy efficiency rated is "C" overall, so that's not the best, but this is the average for these types of appliance. One real drawback is that it's quite loud with an output of 75dB. This is louder than the average vacuum cleaner, and quite a bit louder than the previously reviewed Thomas model. Another thing you do need to be wary of with this model is it will bounce around a bit if you don't load it properly. Like most spinners, this can take a while until you get the knack. A big plus for this Indesit spin dryer is it comes with massive 10-year parts warranty and one-year free labour. If you're looking for a spinner from a brand you can trust - this is it. Which Spin Dryer Is For You? We're confident any of the spinners on our list will do a good job for you and your clothes. If you're looking for the best one for the money, then the White Knight model takes that title. For us, the ​fast spinning speed, larger capacity and great price set it apart from the competition. And it looks great, too!